Whilst in no way undermining the importance of Genetics, it does undermine genetic determinism because it allows that virtually everything in the life span of an individual – from diet and nutrition, to ingestion of toxins, to social experiences, etc, etc – can influence the expression of genes to produce differences in motivation, temperament, cognition, behaviour and mental health. Bruce Lipton (2008) has put forward evidence to claim that emotions and even unconscious beliefs can bring about epigenetic modification. Conrad Waddington is credited with first using the term ‘epigenetics’ in Biology in 1946. ‘Epi’ is a Greek term meaning upon or above. Thus, epigenetics reflects the effects that take place upon, above or in addition to genetics.This original definition implied that something aside from genes was involved in developing the phenotype. As genetic determinism became dominant in many areas of Psychology and Psychiatry throughout the second half of the 20th Century, Epigenetics was slow to develop. However, Brian Hall (1998) was unequivocal about its importance, stating that Epigenetics is concerned with genetic and non-genetic factors that affect gene expression. Hall further noted that the code of heredity includes an extra layer in addition to DNA. By the 2000s the likes of Frank Masterpasqua (2009) were using epigenetics to describe how experiences shape heritable genetic expression. According to Masterpasqua, psychosocial and environmental factors alter epigenetic mechanisms which, in turn, influence normal and abnormal psychology. Epigenetic changes do not alter or mutate the DNA. Instead, epigenetic mechanisms affect DNA by regulating the expression of genes. DNA methylation is the best understood epigenetic modification which results in the inability of genetic information to be read from DNA. In other words, epigenetic modification can turn off a gene. According to Irving Gottesman & Daniel Hanson (2005), this mechanism of turning off genes is reversible. Genes contained within DNA constitute a complete instruction set. Epigenetics, in part, controls if and when these individual genes are expressed. The epigenome, a set of chemical markers attached to the DNA, is described by Amber Dance (2010) as a secondary code that acts like a referee in activating and de-activating genes – effectively making genes ‘silent’ or ‘active’. Jon Freeman with Juliana Freeman (2013) describe the mechanism as ‘regulatory proteins’ covering the gene so it cannot be read; these proteins alter their shape under environmental influences, thus allowing access to the gene. Clearly, this epigentic modification has a strong influence on the development of an organism and can alter the expression of individual traits. 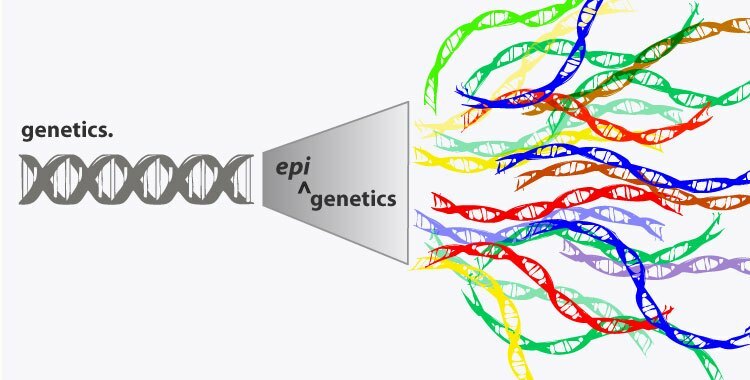 Epigenetic modifications can also be inherited from one generation to the next. Specifically, the effects of epigenetics may be transmitted from parents to children through meiosis and mitosis – processes that pass genetic information from the father into the sperm and from the mother into the egg. Hence, Vardhman Rakyan et al (2002) state subsequent generations may be affected by the epigenetic changes that took place in the parents. Epigenetic modifications in offspring, resulting from parental care-giving environments, may also be passed down from generation to generation. Thus, we may inherit instinctive likes, dislikes and fears from our parents through epigenetic transmission. This may, in part, help explain the contentious theory of race memory and Carl Gustav Jung’s (1916) concept of the collective unconscious. However, some epigenetic changes are temporary and/or may be reversed within a lifetime. Epigenetics has implications for Evolutionary Psychology which tends to portray adaptive change as taking place perhaps over several generations. Although Stephen Jay Gould (1981), in his theory of Punctuated Equilibrium, had drawn attention to evidence that some species went through periods of very rapid change and James Grier & Theodore Burk (1992) have also noted rapid change behaviours, there was no mechanism for explaining such rapid changes until researchers like Catherine Dulac (2010) started looking at generational change in species as a consequence of epigenetics. This approach also lends support to Jean Baptiste Lamarck’s (1809) contention that changes in an animal would be inherited by the next generation – often seen as incompatible with Charles Darwin’s (1859) generally-accepted theory of Natural Selection. Eve Jablonka & Marion Lamb (2002) posit that Epigenetics can be accommodated within a neo-Darwinian framework. In this context, heritable epigenetic differences are viewed as part of long-term development whereby the number of generations through which epigenetic modifications traverse is dependent on the duration of the influence on the genes. While science is still in the early days of applying epigenetic principles to Psychology beyond the Evolutionary approach, clearly the concept of epigenetic modification has major implications for further development of our understanding of human thought and behaviour. The concept fits perfectly with Reciprocal Determinism – ie: that there is a near-constant loop of people shaping their environment and their heir environment shaping them – with change in one leading to change in the other. The concept also provides an explanatory mechanism for the emergence of vMEMES. Clare W Graves’ research (1970, 1971b/2002) laid great emphasis on the symbiotic relationship between the internal motivational system emerging to match the life conditions. (Jane Loevinger (1976) reflected this to some extent with her concept of ‘pacers’ – as did Lawrence Kohlberg (1963) with his ‘push & pull’ approach to the emergence of different stages of moral development). Don Beck’s (2002a) concept of the prime directive (paralleled in the work of Abraham Maslow (1956, 1970) and Carl Rogers (1959, 1961) by the actualising tendency) implies that there is a pre-programmed capacity to cause vMEMES to emerge in response to the life conditions. Epigenetics allows us to theorise that the genes responsible for the emergence of each mode of thinking are switched on by the current life conditions. The undermining of genetic determinism implies that we are not ‘prisoners of our genes’ but that there is a capacity for change within our genetic potential. For example, if we have the traits of a particular temperament, then we may indeed be able to grow beyond the limits of that temperament. In an almost-Lamarckian way, if we practise repeatedly doing something that is not our natural ‘self’ – especially if rewarded via Operant Conditioning – then we may indeed experience change at a profound level. This may then be reflected and consolidated in how we conceived our self in our selfplex. Please consider adding share buttons to your posts, e.g. AddToAny. Done! Thanks for the suggestion, John. for me the point of the group is to help everyone reach their full potential and it now seems that doing that will involve more understanding of how we can consciously control our life circumstances to effect changes in our epi-genes. Epigenetics throws up in the air a lot of the “I can’t help it: that’s the way I am!” kind of stuff. Abdicating responsibility to your genes is no longer quite that easy. Of course, Epigenetics is in its early days and not yet well understood. I’ve not heard about the 2/3 thing. If you can forward a link, I’ll look at updating the page. Your group is definitely one to watch out for and I encourage visitors/readers to go check it out.